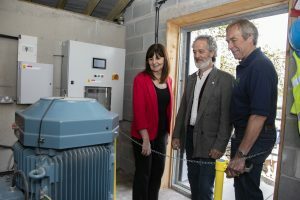 Lesley Griffiths AM, the Welsh Government Cabinet Secretary for Energy, Planning and Rural Affairs, visited Corwen on May 17th to officially open Corwen Electricity Cooperative’s hydro-electric scheme. The Cabinet Secretary attended the launch of the scheme at Canolfan Ni and then visited the turbine house for a ribbon-cutting ceremony. 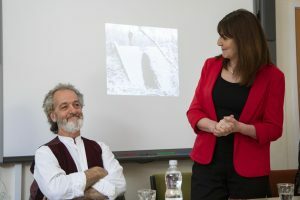 The turbine house is in the town centre and is driven by the Nant y Pigyn and Nant Cawrddu streams which plunge 500 feet from a reservoir high above Corwen to generate 55 kilowatt hours of electricity, enough to supply 40 homes a year. 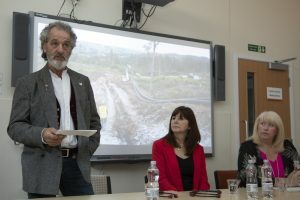 The scheme is largely entirely owned by local people who are now set to benefit from cheaper electricity. 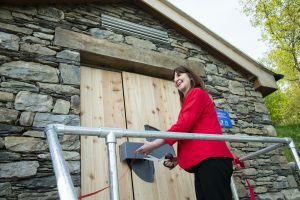 Cadwyn Clwyd; Welsh Government Energy Minister Lesley Griffiths at the opening of the Corwen Hydro; Pictured Welsh Government Energy Minister Lesley Griffiths at the opening of the Corwen Hydro Project turbine house with Project Chairman Mike Paice and Project shareholder and volunteer technical adviser Huw Smallwood.